Ceramic processes are deeply entrenched in our societal psyche as they involve our oldest technologies and our newest. These range from the simple vessels that allowed us to move away from our water sources to the most advanced technologies that have been instrumental in allowing us to expand our influence beyond the planet. In the ceramics lab we begin to see how our day-to-day lives are saturated with ceramic objects and technologies that go unnoticed. This impact is revealed and celebrated as a form of aesthetic production in its own right. The capacity to alter our surroundings to benefit our circumstance, and the capacity to be self-aware, are the two qualities that make humans unique. In studio art courses we take those capacities out of their normal settings and away from their purposes of self-preservation and we explore their potential for aesthetic ends. Exercising these capacities in this way allows us to reimagine our relationship to our surroundings and to deepen our understanding of our relationship to experience, others, and ourselves. What we are doing in studio art courses is not only exercising the capacity to re-imagine our individual possibilities but also exercising our cumulative potential for growth as a species. 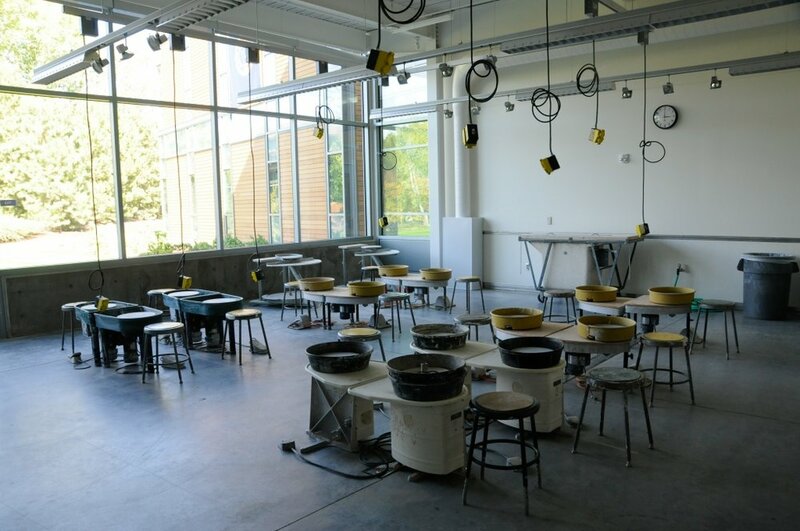 The complex processes taught in the Ceramics lab develop a range of creative problem solving strategies that provide for the needs of many learning styles and intelligences. The humanists, scientist, and social scientists will all feel at home there. Developing the spatial and extra rational aspects of human experience enrich all of our lives by allowing us to make complex associations between disparate ideas. These abilities will enrich the intellectual lives of students from any area of the college.